We have to say it – here at HIP we have the coolest volunteers. Charlie is one of them. Also known as “Ornery” (a nickname she wears with pride), Charlie is 66 years old and has been volunteering at our Senior Meals program for roughly one and a half years. She grew up in Montana, where she worked at her family’s six restaurants from the age of nine. From there she went on to get degrees in medical lab technology, histotechnology, scientific illustrative drawing, criminal justice, and psychology. She also spent three seasons as a firefighter for the National Forest Service – all despite overwhelming odds. Not only does she have multiple college degrees, she is a veritable jack of all trades. Whether you need a machine fixed, a room decorated, or an animal birthed, Charlie can do it all. 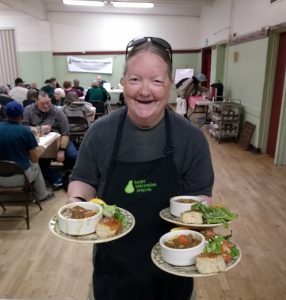 Unfortunately, due to her bad back and knee, she has difficulty finding work in Seattle, but that doesn’t deter her from volunteering whenever she can. Thank you, Charlie, for your dedication and down-to-earth attitude. We appreciate everything you do! P.S. Charlie will be participating at “Listen Up!,” a multigenerational poetry presentation at the Repertory Theatre on April 23rd at 7pm. The program will be partnering with the Silver Kite Intergenerational Theatre Company. Tickets are $5 – stop by if you have a chance!